What Are the Causes of Brittle Fingernails That Crack & Split? Brittle nails are a common complaint among women of all ages. Men can experience this problem too. From nutrient deficiencies to aging, hypothyroidism and prolonged exposure to water, cracking fingernails can have a variety of causes. Any changes in fingernail color and texture may be a sign of illness. If you have brittle nails, consider changing your diet. Many times, split nails are due to nutrient deficiencies. Make sure your meals provide enough protein, iron, calcium and biotin. Also known as _onychoschizia_, this condition is more prevalent in women and can be linked to underlying issues, such as thyroid disease or iron-deficiency anemia. As the American Osteopathic College of Dermatology notes, onychoschizia is an umbrella term for brittle, thin, soft or split nails. Most times, it's characterized by either too much or too little moisture in the nails. Read more: What Makes Nails Grow Long, Strong & Fast? According to the Berkeley Sensor & Actuator Center, nails have a 10 to 30 percent water content. Too little moisture can result in brittle nails and decreased flexibility. Vitamin deficiencies, polish removers, harsh soaps and injury to the fingers can further damage these tissues. If you have this issue, you may notice that your nails are softer than usual and tend to break easily. They may be dry, weak, pitted, rough, discolored or torn. These symptoms can be due to underlying illnesses or a combination of lifestyle and environmental factors. Roughly a third of people worldwide suffer from anemia, according to a 2015 article published in The Lancet. Iron deficiency accounts for about 50 percent of all cases. This condition may cause fatigue, shortness of breath, dizziness, headaches, irregular heartbeats and more. Brittle nails are also a common symptom of iron-deficiency anemia. Some individuals may also experience spooning of the nails, tongue soreness, poor mental focus, chest pain and irregular heartbeat. Depending on the severity of your condition, you may need to take iron supplements or tweak your diet and eat more foods containing this mineral. Beef and chicken liver, eggs, shellfish, canned sardines, poultry, fortified cereals, cooked beans, baked potatoes, nuts and seeds are all excellent sources of iron. Also known as vitamin H or B-7, biotin is one of the most important nutrients for healthy hair, skin and nails. Even the slightest deficiency can affect how you look and feel. According to a 2017 review published in the journal Skin Appendage Disorders, diets low in biotin may lead to depression, seizures, conjunctivitis, hair loss, skin rashes and lethargy. The article examined 18 cases of patients with poor nail or hair growth. All of them showed major improvements after taking biotin supplements. If you have brittle nails, consider adding more biotin to your meals. Some of the best dietary sources include beef liver, eggs, canned pink salmon, sweet potatoes and sunflower seeds. A high biotin intake is particularly beneficial for pregnant and breastfeeding women as well as for people with chronic alcoholism, because their bodies cannot properly absorb this nutrient. Protein is an integral part of your cells and tissues. If you have dry, brittle nails that break easily, your diet might not provide this nutrient in sufficient amounts. Certain proteins, such as keratin, protect your nails from stress and increase their resilience to friction and trauma. Make sure your diet is rich in lean meat, fish, eggs and dairy. Vegans and vegetarians can opt for plant-based protein sources like beans, soy milk, tofu, almonds, chia seeds, pumpkin seeds, lentils, chickpeas and quinoa. Another option is to sip on protein shakes, especially if you have an active lifestyle. There are many other causes of brittle nails, including calcium and magnesium deficiencies, vitamin C deficiency, thyroid problems and overexposure to moisture. Certain detergents and household cleaners may affect your nails too. Sometimes brittle nails can be a symptom of autoimmune or inflammatory disorders. Tweak your diet and switch to natural or organic household cleaners and soaps. Consider taking biotin supplements. If your symptoms persist, consult a medical professional, who will assess your condition and determine the exact cause of your cracking fingernails. 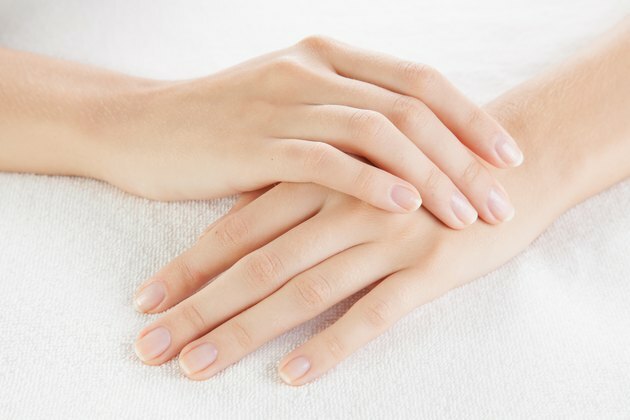 What Is the Body Lacking for Dry Nails?